Want to see your conference room’s calendar events on your Dolby conference phone? We have just the feature for you! Highfive's Google calendar integration will let you tap-to-join meetings that your conference room is booked for, right from your Dolby device. Your organization uses Google G Suite for work. Your meeting rooms are set up as Google Calendar resources. Learn more about the Domain Dashboard. Next to Google Calendar Resources, click Setup. Review the steps displayed to make sure you have everything you need to complete the setup. A new Google page will open. Select your Google account and log in. After you are redirected back to the dashboard, click on the drop-down Meeting Room menus and match your Device name with the appropriate resource (conference room) name. Note: Make sure the Highfive system is not in use when making these changes. Click Confirm assigned rooms to save your settings. Within the next 3 minutes, your Dolby conference phone will update to display your room’s events. Your Dolby conference phone will display up to 3 current and upcoming events. Is this available for Microsoft Outlook Calendar? I tapped on an event, but do not see the option to join. What happened? Highfive connects with Google to display all events that your room has been booked for. You will only be able to join events that are Highfive meetings, which are scheduled with our Google Calendar extension. 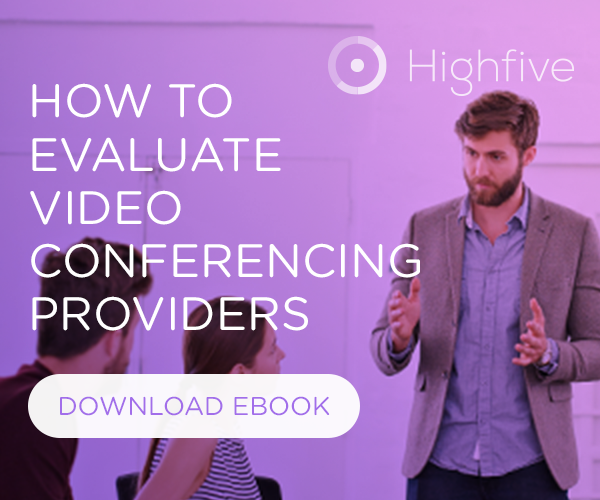 Click here to learn how to schedule Highfive meetings. How does the integration decide which events to show? Any scheduled meeting that has the conference room added to the event will be displayed. For security and privacy, meetings scheduled via Google Calendar as Private events will have the display name "Reserved" and cannot be joined from the Dolby conference phone. A meeting will continue to be displayed for one (1) hour after it’s start time. This allows late-starters to still join the meeting from the Dolby conference phone. If you leave a meeting after 1 hour has elapsed, you will not be able to rejoin it from the Dolby conference phone. Instead, you can rejoin from a computer or mobile device, and then move the call up to your TV. I don’t see my Meeting Room name under the Integration Settings page. What do I do? We’ve changed our meeting room names in G Suite. What do I need to do in Highfive to update this? Go to the Devices page on your Domain Dashboard to rename your Highfive units. I accidentally matched the incorrect Meeting Room to my Device. Will this break something? No, but it can make the Highfive experience confusing for your users. Simply go to your Domain Dashboard and select “Unassigned” or pick the correct Meeting Room name and save your settings to fix this. If you have any questions or issues regarding the Dolby conference phone's integration to Google Calendar, please contact the Highfive Support team at help@highfive.com.